At any rate, her entrance at the Conservative Party Conference — set to ABBA's "Dancing Queen," naturally — wasn't just a self-deprecating reference to the recent viral video of her rather unconventional dance moves. The move aimed to project ease and confidence, both of which have been in short supply for Brits as they negotiate their departure from the European Union. "What we are proposing is very challenging for the EU," May told the Tories assembled in Birmingham, U.K. "But if we stick together and hold our nerve, I know we can get a deal that delivers for Britain." With just about six months to go until the U.K. leaves the EU next March, that sense of certainty is not shared by many British lawmakers, who have expressed their doubts lately from both ends of the ideological spectrum. 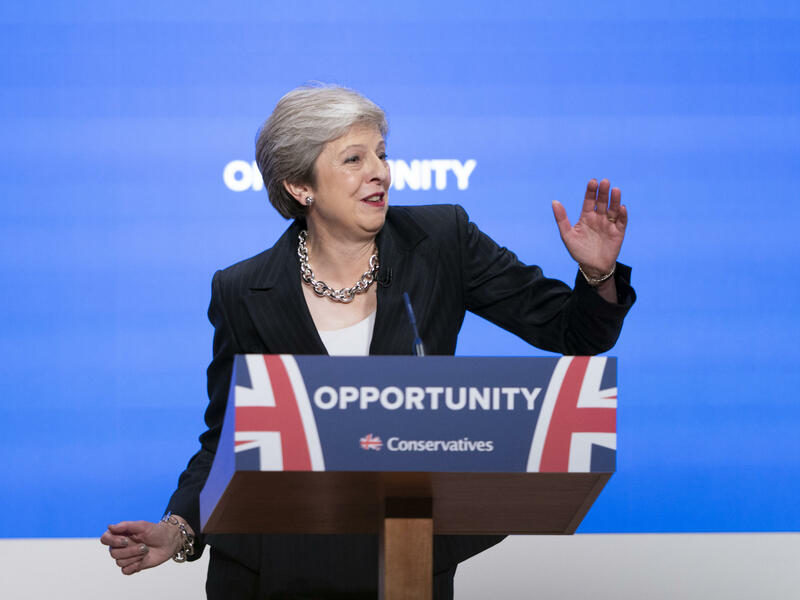 Criticism from the left, such as Labour leader Jeremy Corbyn, is much to be expected — but May has also suffered sharp rebukes from fellow conservatives. Boris Johnson, who resigned as foreign secretary over Brexit concerns, described May's proposals as "publicly humiliating" during his speech to the conservative conference a day earlier. Even David Davis, the secretary in charge of Brexit negotiations, resigned his post in protest of a plan that has "a number of weaknesses." EU officials have so far rebuffed U.K. proposals, dismissing them as unrealistic. European Council President Donald Tusk said her proposals, which would maintain a free market with the EU while largely closing the door to EU workers, just "will not work." "The EU is adamant that you can't have the free movement of goods without accepting EU workers — that would break the rules of the club," NPR's Frank Langfitt explains. "Eventually, people in the EU think it would lead to the disintegration of the union." There is also the contentious matter of Northern Ireland. The region, which is part of the U.K., has an open land border with the Republic of Ireland as part of the 20-year-old Good Friday Agreement that ended decades of sectarian violence. This open border could undermine any trade barriers erected with a Brexit deal. And the two main solutions offered — closing the border, or adding checks on goods that cross the Irish Sea — have proven to be nonstarters so far. This particular problem is politically thorny for May. After a disastrous showing in snap elections last year, her ruling government depends on support from the Democratic Unionist Party in Northern Ireland. "In Northern Ireland we've grown up with a lot of fears and issues that we've faced; frankly, being afraid of what Theresa May may do is not one of my biggest fears," Nigel Dodds, a DUP leader, told the Guardian this week. The challenges that May is facing did little to dampen the gusto of her speech to conservatives Wednesday. She reasserted her commitment to finding a realistic compromise with the EU — unlike some of her conservative rivals, who she said "are not acting in the national interest, but their own political interest." "This is our proposal: taking back control of our borders, laws and money. Good for jobs, good for the union. It delivers on the referendum. It keeps faith with the British people. It is in the national interest," she told the conference Wednesday. "Even if we do not all agree on every part of this proposal," May added, "we need to come together."